OS X’s Boot Camp lets boot your Mac into Windows, temporarily turning it into a Windows PC. It’s a great feature, but if you value your Windows data—or if you want to be able to restore your Boot Camp partition to another Mac or to a new hard drive—you should back up your Windows partition just as you back up your OS X data. In my experience, many Boot Camp users don't. Part of the reason, I’m sure, is that even the best Mac backup software—including OS X’s own Time Machine—can’t properly back up a Boot Camp partition. And even standout Mac-cloning utilities such as SuperDuper and Carbon Copy Cloner are unable to make clones of your Boot Camp partition for migrating or restoring your Windows install. Winclone 4.1, on the other hand, can do all these things. (I reviewed Winclone 1.6 back in 2007, and it’s been updated many times since then.) This utility can create a disk image of your Mac’s Boot Camp partition, making it easy to back up that partition, restore it from a backup, or transfer it to another Mac. You can even use Winclone 4 to resize an existing Boot Camp partition. 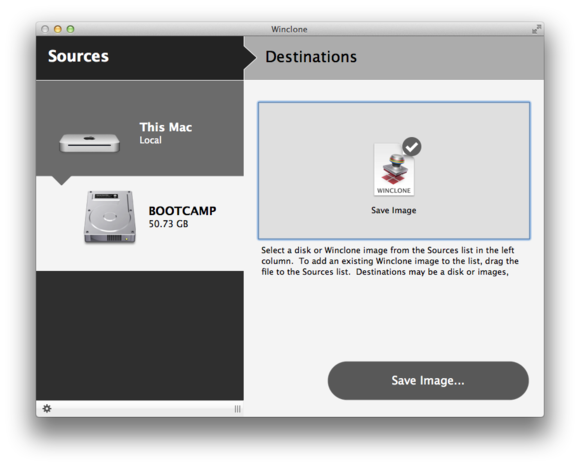 To clone your Boot Camp partition, you just select it in Winclone’s Sources list, click the large Save Image icon in the Destinations pane to the right, and then click the Save Image button. If you plan on restoring to a Boot Camp partition that's smaller than your current partition, the Shrink Windows (NTFS) Filesystem option lets you first compress your current Boot Camp installation. (For extra data security, the developer recommends running CHKDSK from within Windows before cloning. Similarly, if you’re migrating Windows installations between computers, you should use Windows’s SysPrep utility before cloning.) Choose a location for the saved image, and Winclone creates an OS X disk image containing a perfect clone of your Boot Camp partition. Restoring that image is just as easy. You just select the image in Winclone’s Sources list, choose your (presumably empty) Boot Camp partition in the Destinations pane, and click Restore To Volume. You can also now restore a Boot Camp partition over a local network by enabling the Share Winclone Images On Network option in Winclone, and then running Winclone on both the source and destination machines. The source Mac’s Boot Camp partition will appear in the destination Mac’s Source list. The source Mac will also share any clone images you've created. As our GemFest reviews are brief, I’ve only summarized the capabilities of Winclone 4. Suffice it to say that if you use Boot Camp frequently, or on multiple Macs, Winclone should be in your tooklit. It’s easy to use, it works well, and the developer provides excellent how-to documentation. Winclone is a stellar utility for backing up, restoring, and migrating Boot Camp partitions.